Metro conventions are observed. There’s always a place for appealing ingenues in the Dressler/Morans, their being family-set comedies. Anita Page is ravishing as Marie’s unlikely daughter in Reducing. She’s nearly seduced by seeming cad Buster Collier, Jr. until mother intervenes. Both Politics and Reducing are schizo unpredictable in ways I loved. You never know when comedy’s mask will drop for stark tragedy’s intrusion. Politics’ story is set in motion by the gangland murder of Polly’s daughter, a moment played utterly straight (and well) by Moran. Plots seem to generally turn on small town virtue versus big city artifice and corruption. Had I but been born during flapper days, I'd have lined up with hard-earned nickels for this team. The Lord only knows how many actually did. I looked at figures for the Dressler/Morans and they were all socko. TCM is soon running another on my not-seen list, Prosperity, and it’s for sure the DVR will stand at alert. It occurs to me that these modest features would play nicely to any audience. All are of a piece with comedies we’ve known and enjoyed so repeatedly through movie buffing lives. Why didn’t I notice Dressler/Moran before? Maybe because they were rarely shown. Strike that. Make it never shown prior to TCM, at least where I’d have had access. It wouldn’t do to dismiss these as mere dumb slapsticks. Dressler was too human and sensitive an actress for that. Hoary gags as interpreted by her taste of ambrosia. To think that were it not for Warner Archives, I might never have bothered, but here’s the kicker: Both Politics and Reducing are excellent transfers. They look as good to me as any pressed DVD to come out of WB. That Dressler sale package includes six features for $59.95, including Politics, Reducing, Emma, Let Us Be Gay, Tugboat Annie, and Min and Bill. All are worth seeing (and having). Check this previous Greenbriar post for a nutty 1931 Reducing promotional. Truth to tell, though, it doesn't take more than a nudge to get me on the Dressler bandwagon. If you want proof that she was a great actress, never mind Emma or Min and Bill; you need look no further than the scene in Dinner at Eight where she and Lionel Barrymore reminisce about her youth as the glamourous toast of Broadway. She convinces us, even as our eyes tell us (and a look at her photos from 1900 on confirms) that this old battleaxe never looked like anything but the back end of a bus. Yet Marie sits there flouncing and preening, as if to say "Who are you gonna believe, me or your lying eyes?" and we're hooked. I couldn't agree with you more about Dressler's scene with Barrymore in "Dinner At Eight". Even George Cukor said that Dressler wasn't fooling anyone when she pretended to be a Lillian Russell of that time. But one also knows and sees they are in the presence of truly overwhelmingly great acting! The screen lost a great deal of humanity when she passed. "[Emma's] setup doesn't entirely bear scrutiny... but it doesn't matter, it's all about her frumpy-old-lady common sense telling the world what's what, a Mr. Deeds for the support hose set, and you can see why her audience ate it up and she got an Oscar nomination. " I saw a revival of DINNER AT EIGHT with my parents back in the late seventies and Marie Dressler was the one star I was not at all familiar with. On the way home, she was the one we talked about most! I was familiar with Dressler from Dinner at Eight; of course she's good but the role is similar to other crusty, older ladies from 30s films (maybe they were imitating her). But a few years ago I had TCM running in the background and they were screening REDUCING... the "I can't believe this is happening" expression Dressler has as mayhem breaks loose amplifies the gags, which are already good. PROSPERITY, POLITICS are along the same lines. Dressler is so likeable and able to make everything around her intensely funny and interesting. Same more or less goes for Min and Bill, though its not a comedy at all. Were these Dressler-Moran pictures included in MGM's pre-48 syndication package? Years of watching the late late show and I don't remember ever seeing a one of them. Do all old-time projectionists look like that guy? Hal, the Dressler/Morans were in the Pre-48 Greats syndicated group from MGM, though how many stations chose to run them I don't know. I went to high school in Beverly Hills with a boy (we later became wriing partners for awhile) whose parents lived in Dressler's old house on Bedford Drive. (James Roosevelt was a later occupant). Another wonderful team of that period were Mary Boland and Charlie Ruggles at Paramount. Here's hoping you'll do a post on their films at some point. Your masthead today on the "custom posters" was really something. As I am doing a project, as I've mentioned before, on Lon McCallister (and William Eythe), I was naturally very interested in "The Red House" piece. For a guy who supposedly had a "lightweight" career, as even McCallister himself admitted to, he managed to work with some "heavy hitters" -- and as anyone who has seen McCallister's work can attest to, he more than held his own! As for "The Red House", that's a really good one, isn't it? Not another like it, and a film I'd really like to see released on good quality DVD (I believe the pic is PD). Honestly it's a real shame that all those great "little" Paramount films of the 30's are comsigned now to some sort of celluloid "no-man's land". Universal has released SOME titles of course, but I had to go to a little store here in the Valley to find a copy of Jack Benny's "Artists and Models", as well as "Buck Benny" -- and much to my surprise, they held-up better than I remembered them! The Ruggles-Boland series was absolutely charming as I recall. And, somebody on "Flickr" posted a rare still of something I had quite forgotten about from a Paramount of 1936, called "Hollywood Boulevard" about a forgotten star, well-played by John Halliday, with a number of silent stars in "cameos" and even Gary Cooper, playing himself! (Can't help wondering now if Billy Wilder wasn't think of this when he did a not dis-similar film at Paramount!) Oh, and then there is the venerable old "Double Door" from 1934, with Mary Morris (who was later Bill Eythe's acting coach at Carnagie Tech). The list is, let's face it John, endless! "The Red House" which was produced by Sol Lesser, for U-A release, is now I believe PD. McCallister was on record as saying he thought it was his best film, and it probably was! 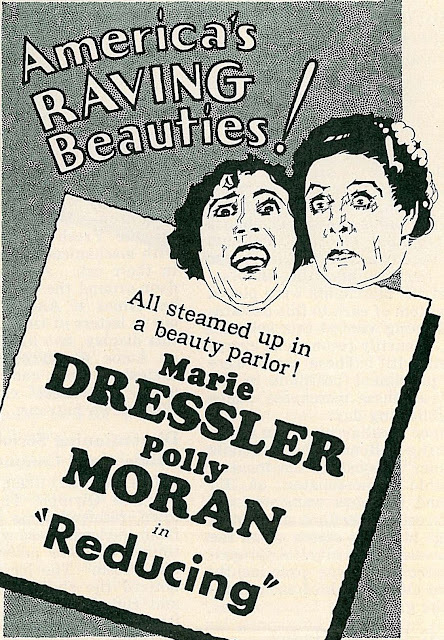 Welcome to the small ranks of Marie Dressler and Polly Moran fans. Thanks for your blog on the subject. 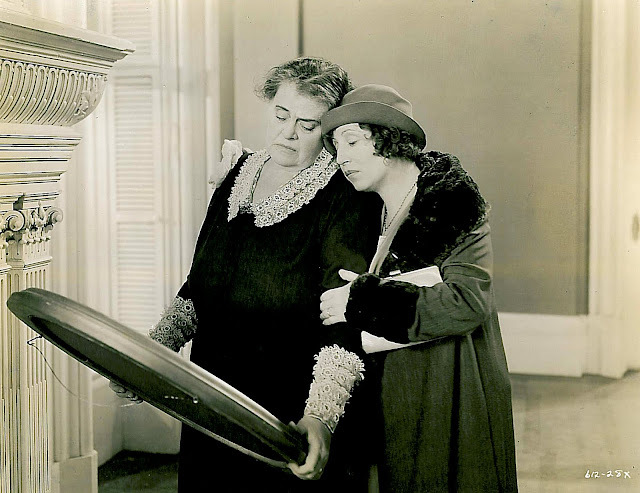 I have thought for years that Marie Dressler was so under rated these days because no one could see her films. I also thank WA for releasing these five films and hope that more will come. I would also like to see CHASING RAINBOWS, even in its cut version and she is without Polly. By the way I also enjoyed your mussing on hunting down 8mm & 16mm prints. Just stumbled upon this post about a month late but I must comment. Count me among the small but discerning pack of Dressler fans. Up until last year, I had only seen Dinner at Eight. I had never seen anyone quite like her - very natural and spontaneous, larger than life (certainly), with immaculate comic timing, a comic's rubbery face and very strange eyes. As no one else has mentioned it, I must point out that her double-take/stutter-step at the very end of the film is one of the high points of physical comedy. She just plain stole the movie for me. Then TCM's Summer Under the Stars 2008 had a full day of Dressler ( a day after having watched 16+ hours of Chaplin - I was already a weary pup). I started with Tillie's Punctured Romance at 6am and watched more or less straight through Min and Bill that evening. It was heaven. Whether playing slapstick or pathos, she just seemed to be completely in the moment, totally committed to the emotion of the scene. But I must also say that Polly Moran doesn't do it for me. At times, she comes across as a Fanny Brice wannabe. Part of the problem is the roles she plays. Her characters are so nasty and petty and cause Dressler's characters such consternation and heartache. I have a hard time believing, even within the context of a farce ( Prosperity, for instance), that Dressler would ever want to set eyes on her again. 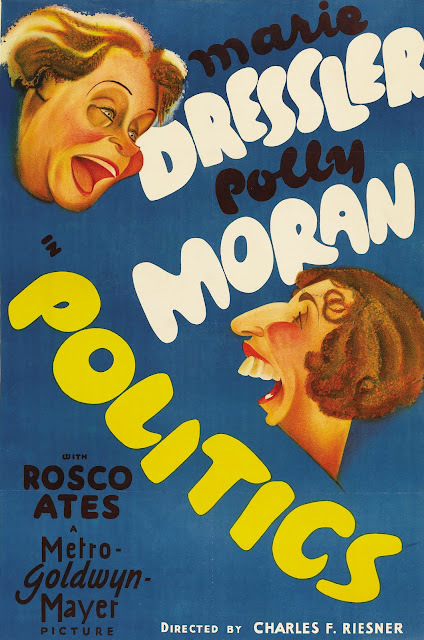 I love skillful mugging (Dressler being a master in her silent films), but I find Moran too broad and unfocused. It's past 1 in the morning right now but I'll be getting up in about 5 1/2 hours to watch The Patsy on TCM. I can't wait.